Sometimes it’s just too sunny outside. Amiright? One to watch: Dan Martin took an historic Tour de France stage win last weekend… can he be first up Ventoux on Sunday? (Hint: Yes). One to Sky+: Munster hurling final and a Leinster football decider? One to tape if you’re heading for the nearest tyre-on-a-rope over a river. One to skip: We’re all tennis’d out. Cricket: First Ashes Test, England v Australia (Sky Sports Ashes, 10am). 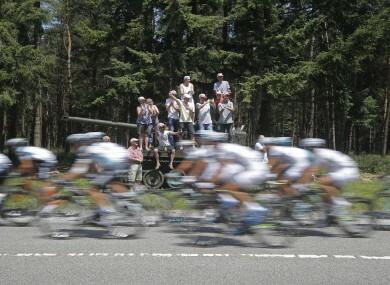 Cycling: Tour de France, stage 13 from Tours to Saint-Amand-Montrond (British Eurosport 12.45pm, TG4, 1.10pm & ITV4, 2pm). Football: Women’s European Championships, France v Russia (British Eurosport, 5pm); England v Spain (British Eurosport, 7pm & BBC3 7pm); CONCACAF Gold Cup, Trinidad and Tobago v Haiti (ESPN, 12am); Honduras v El Salvador ( ESPN, 2.30am); League of Ireland, Shamrock Rovers v Derry City (Setanta Sports Ireland, 7.30pm). Golf: European Tour, Scottish Open (Sky Sports 1, 10.30am); PGA Tour, John Deere Classic (Sky Sports 3, 8pm); US Seniors Open (Sky Sports 3, 11pm). Horse racing: From Newmarket (Channel 4, 1.30pm). Rugby: Super Rugby, Crusaders v Hurricanes (Sky Sports 4, 8.30am); Rebels v Highlanders (Sky Sports 4, 10.30am). Tennis: WTA Internazionali di Sicilia (ESPN 5.30pm). World university games: Volleyball from St Petersburg, Russia (British Eurosport, 10am). Athletics: British Athletics World Trials and UK & England Championships (BBC1, 2pm). Boxing: Luke Campbell v TBA & Kell Brook v Carson Jones (Sky Sports 1, 8pm). Cycling: Tour de France, stage 14 from Saint-Pourcain-sur-Sioule to Lyon (British Eurosport, 12.30pm, TG4, 1.10pm & ITV4, 2pm). Football: Women’s European Championship, Italy v Denmark (British Eurosport, 5pm); Finland v Sweden (BBC3, 7pm); CONCACAF Gold Cup, United States v Cuba (ESPN, 8.30pm); Costa Rica v Belize (ESPN, 11pm); Under-20 World Cup final (British Eurosport, 7pm); Pre-season friendly, Preston v Liverpool (ESPN, 3pm). GAA: All-Ireland SHC qualifier, Kilkenny v Waterford (TV3, 6.30pm). Golf: European Tour, Scottish Open (Sky Sports 1, 2.30pm); PGA Tour, John Deere Classic (Sky Sports 3, 8pm). Horse racing: (Channel 4, 1.30pm). Motor cycling: MotoGP, German Grand Prix qualifying (BBC1, 1pm). Rugby: Super Rugby, Blues v Chiefs (Sky Sports 1, 8.30am); Waratahs v Reds (Sky Sports 1, 10.30am); Western Force v Brumbies (Sky Sports 1, 12.30pm); Sharks v Kings (Sky Sports 4, 4pm); Stormers v Bulls (Sky Sports 4, 6pm); Women’s international, New Zealand v England (Sky Sports 1, 6.30am). Tennis: WTA Baku Cup (ESPN, 8am). Cricket: First Ashes Test, England v Australia (Sky Sports Ashes, 1pm). Cycling: Tour de France, stage 15 from Givors to Mont Ventoux (British Eurosport 12.30am, TG4 1.10pm & ITV4, 2pm). GAA: Leinster SFC final, Dublin v Meath (TV3, 1.15pm); Munster SHC final, Limerick v Cork (RTÉ Two, 3.15pm); The Sunday Game (RTÉ Two, 9.30pm). Golf: European Tour, Scottish Open (Sky Sports 1, 2.30pm); PGA Tour, John Deere Classic (Sky Sports 1, 8pm). Football: Women’s European Championship, Norway v Netherlands (British Eurosport, 5pm); Iceland v Germany (BBC3, 7pm & British Eurosport, 7pm); CONCACAF Gold Cup, Martinique v Mexico (ESPN, 11.15pm); Pre-season friendly, Indonesia v Arsenal (ESPN, 2.45pm). Tennis: WTA Baku Cup (ESPN, 10.30am).